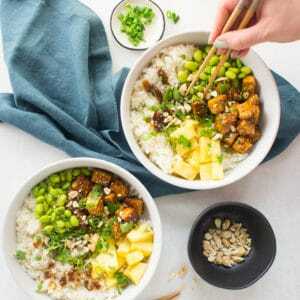 This easy recipe features crispy tofu covered in teriyaki sauce paired with fluffy white rice, pineapple, and edamame. Top with cilantro, green onions, chopped cashews, and sesame seeds for a wholesome bowl! With two methods to cook the tofu, this recipe is very adaptable! 1/2 inch fresh ginger peeled and minced (about 1/2 teaspoon). Can use 1/4 teaspoon ground ginger instead. 1-2 Tablespoons neutral oil such as canola, vegetable, or grapeseed oil. This is only for pan fried method. Press tofu: Open tofu package and drain. Wrap with paper towels or tea towel. Sandwich in between two plates and place a heavy object on the top plate. Let sit for at least 10 minutes. Cook rice using your preferred method. I make mine in my Instant Pot! Add all ingredients (minus 1 Tablespoon water and corn starch) to a pan over medium heat. Stir until sauce begins to thicken. Mix corn starch with water to make a slurry and add to sauce. Heat until thickened up. Add water to thin sauce or more corn starch 1/2 teaspoon at a time to thicken up. remove from heat. Unwrap and cut into cubes. Transfer to mixing bowl. Add corn starch and tamari. Mix well with rubber spatula. Preheat oven to 400 degrees Fahrenheit. Adjust rack to the center. Add tofu to parchment paper-lined baking sheet. Bake for 20-25 minutes, flipping halfway through. Once tofu is cooked, mix with teriyaki sauce until evenly coated. Add cooked rice to a bowl. Top with teriyaki tofu, pineapple, and edamame. Top with desired toppings. Add an extra drizzle of teriyaki sauce!